Welcome to our cottage by the ocean. Don't just imagine sitting on the deck with a chilled glass of wine while the sun goes down, experience it! Relax at the end of your day by dining al fresco. Fall asleep to the sound of the waves and the smell of the ocean. 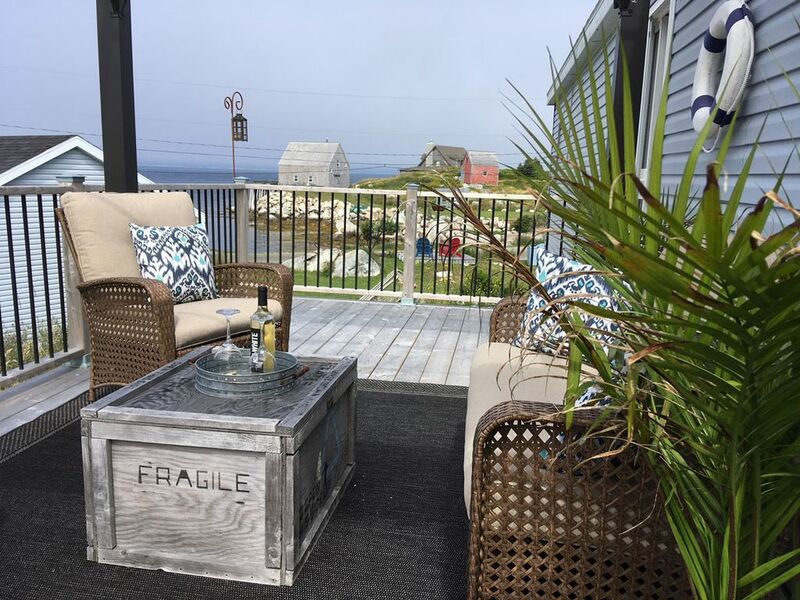 Situated on Middle Point Cove, five minutes from world-famous Peggy's Cove, our one-level cottage includes a fully-equipped kitchen, laundry, bath with walk-in shower, Wi-Fi, and queen beds in each of two bedrooms (sheets and towels provided). A great location for a your stay. I grew up in Indian Harbour, only a stone's throw from this cottage. It is a beautiful place, even in the worst of weather! Being near the ocean brings a sense of peace to my busy world. I hope it does the same for you. The cottage originally belonged to my brother, who was a fisherman. He passed away in 2015 and bequeathed his home to me. In order to be able to keep it, my husband and I made the decision to renovate it completely (no more bachelor pad) and add it to the rental market. Eventually, we will sell our home and retire to this one, where we can enjoy all the natural surroundings! There is ample parking just outside the front door. There is free Wi-Fi and password provided on arrival. There is ample seating with a sofa, and two swivel rocker chairs. Put your feet up and relax. A few staple pantry items such as flour, sugar, and basic spices are included. A 42-inch Smart TV is available, along with an Android box for movies and television viewing. There are a few books available. A few board games are available in the cottage. Bicycle rental and trails are only a 20 minute drive away. The cottage was in spotless condition and all appliances worked as expected. The only disappointment was the TV reception. The streaming services had major difficulties so viewing was spotty at best. This place is just beautiful, it is very cosy and so welcoming. It is also stocked with everything you may need and even more. We had a great three days here and I hope to be able to revisit one day. My husband and I had a wonderful time at the Oceanside Cottage and highly recommend it when touring the south shore of Nova Scotia. The cottage was beautifully decorated and equipped with anything and everything you could imagine to cook a meal. The location on the water was lovely with fabulous sunsets. We were particularly impressed with how quickly the owner, Deborah Crooks responded to any questions we had before and during our stay. The cottage was ideally located for trips to Peggy's Cove, Halifax, Lunenberg, Mahone Bay and lovely beaches from Hubbard to Queensland. We didn't want to leave!!! We had such a great time at Deborah's property which is right next to Peggy's cove! We stayed there for 4 nights but wished we could have stayed longer. The house is really lovely, very cosy and well equipped so as to make your stay wonderful. The view from the property is gorgeous (and the sunsets are just breathtaking), you're close to some great hiking on the rocks near by, you can buy some delicious lobster next door (thanks to Deborah for providing us with a lobster pot!). And Indian Harbour is at the crossroads of many sightseeings (Halifax and the Citadel, Lunenburg and the Bluenose, and Peggy's cove where you can visit Deborah's shop which is very nice). From the time you step into Deborah's cottage, you can feel that she has put all her heart in the decoration of the place. Deborah, thanks a lot for this amazing stay. The Middle Point Cottage is perfect! The scenery is stunning with beautiful sunrises and sunsets each day. The cottage itself is warm and welcoming and has been tastefully decorated and is very well maintained. Deb and Rico are responsive to all communication and the cottage has so many thoughtful things that enhance your stay - a well-equipped kitchen with tea, coffee, soap, etc., the same for the bathroom, and the bedrooms and living room have everything you need to feel right at home. For your entertainment, there was excellent wifi, a smart TV, books, guidebooks and travel brochures, and even binoculars! Although the attractions and activities listed are within approximately 15 minutes away, far more activities are available within an hour.